I’m going to take a wee break from the seed talk and get back to the rethinking of the Potager. This time we’ll talk plants- specifically what needs to change to maximize this fun little space. With this (above) being the state of plant affairs in the potager at the end of last year’s growing season, its clear that a more concerted effort is needed to make this space live up to its potential. Yikes. The corners of chives and bunching onions are establishing themselves nicely and are proving super helpful herbs to have in large supply. The Winter Savory and Thyme plants are also doing well. Everything else, though, is up for review. As I mentioned before, the central focus of the garden is going to need to be a structure of some sort. We are leaning towards building our own tuteur, but nothing is decided yet. The thinking is that if we do go with the tuteur the plan will be to make it at least 7′ tall and big enough to support an assortment of Sweet Peas (specifically Mrs. Collier, Black Knight, and/or Prince Edward of York). As I was reviewing seeds for the “Let’s Grow” series, it occurred to me that the greens I’m growing with difficulty in the veg garden (due to the lack of any shade) might be well suited to this space. It would certainly be in keeping with the very notion of a potager, so I think I’ll use up one section for Swiss Chard (likely a red or pink stemmed type like Bali or Red Rhubarb), some Choy, and another for some lettuces (Speckled Amish, Forellenschluss). This area is close to the tree line along the east border of the garden, so it gets a good dose of morning shade but plenty of good afternoon sun. It should be perfect for greens. I’ll continue to plant annual herbs like Lemon Basil, Cilantro, and Parsley. But many of the others we just don’t use enough of to make the effort worth it. The Oregano did so incredibly well, but we didn’t use a scant 10% of it. The Dill would have been lovely, but every caterpillar in the area thought it a delicacy and ate it down to nubs. I’ve toyed with the idea of this space being a bit of a cutting garden, but that isn’t practical and there are other spaces better suited to that idea. The flowers that I plan to use will be easy to grow and big impact, colorful (but not too tall) annuals. Things like Nasturtiums, Celosia (which my grandmother loved and will always have a place in my heart), and a few Dahlias for simple but effective color all season long. I’m still playing with color schemes, I like the idea of working in reds and pink to play off of the colors in the Chard and Lettuce varieties, but I’m also open to just having it be a boisterous and colorful display. 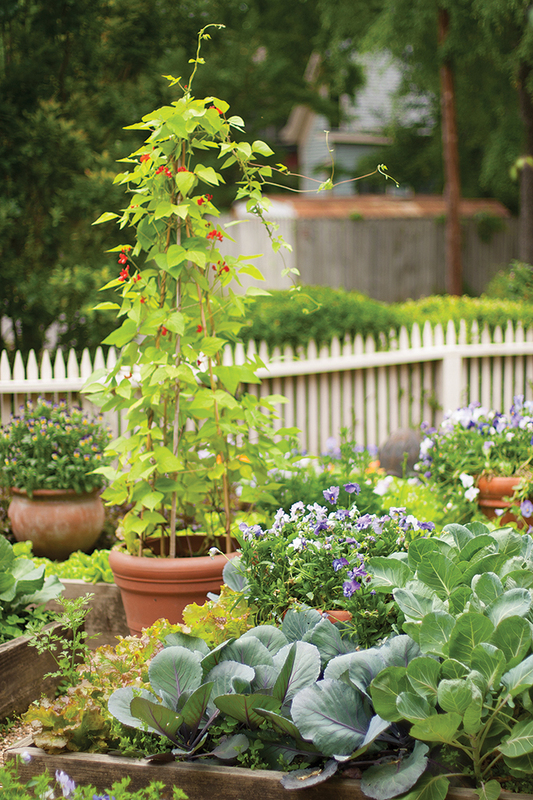 What are your thoughts on potagers? A mix of whatever is working (or whatever I feel like planting a given year) or a studied planting with a cohesive color scheme? 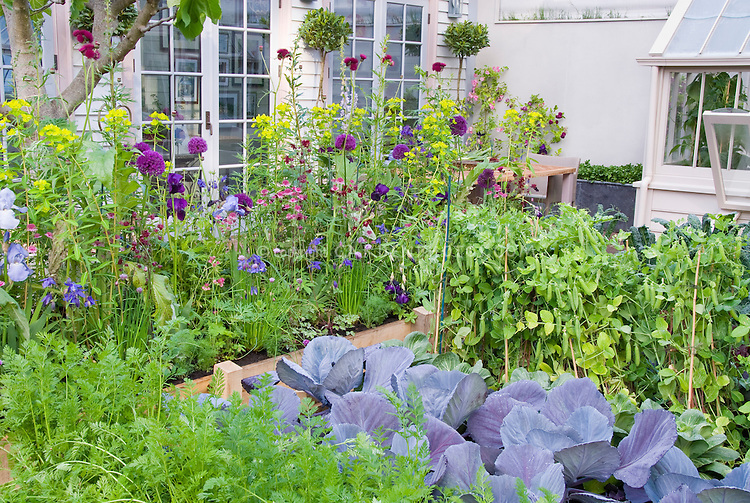 There’s no doubt that this intentional scheme yields beautiful results- especially with those cabbages echoing the purples elsewhere. This looks much more haphazard color-wise, but is still equally lovely. It certainly feels less elegant/studied/curated and more cottagy/eclectic. Obviously neither choice is wrong, but I’m just not sure which one is more right! I’d love to hear your thoughts. Be kind to the Swallowtails and keep planting the dill. If you have the confidence it’s a good idea to build the tuteur, as the ones for sale tend to be either too small or too expensive. I will! I promise to put in some Dill! 🙂 And I totally agree about the tuteur, the one I liked best was $500 plus shipping!! !